Think about it. If you graduate from medical school in 2015, having inherited the knowledge base of the craft of medicine, with all the technological and intellectual advancements available to a finely trained modern physician, is it realistic to think that you will still be doing the same job at the end of your career? I was reflecting on my time at General Assembly in Columbus, Ohio last week. While there, I experienced much hopefulness and creative thinking as I talked to people in the hallways, in the exhibit hall, or over bourbon. But I also ran into a great deal of fear and uncertainty about the future--which you might expect in a denomination that has experienced fairly consistent decline over the past forty-five years. 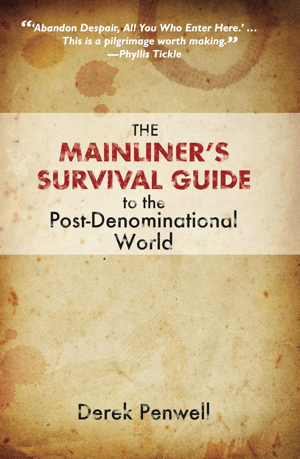 All the mainline denominations are in the same boat (as well as many evangelical denominations); it's just that some are sitting closer to gash in the hull. So, lots of handwringing. The experience reminded me of a workshop I did in Ohio last fall. (What is it with me and Ohio anyway?). I made note of the fact that emerging generations (Millennials and Gen-Xers), having grown up in a “disposable” world (e.g., sporks, iPods, their parents’ marriages, etc.) -- a world that, because of student loan debt and a lack of jobs, requires them to be both mobile and flexible. Emerging generations are much less inclined to want the “stuff” their parents and grandparents have been scrupulously storing up to hand down to them. This is an issue for congregations and denominations that have invested heavily in infrastructure and organizational models, which they worry are not being taken up by the generations coming behind them. I could sense the tension. In a room of 118 people, probably ten were under 50 years-old. Some were sad because they’ve labored so long to bequeath something tangible to the to the generations just coming into leadership. Unfortunately, that “something tangible” seems to be a legacy succeeding generations aren’t terribly enthusiastic about embracing. I know you’re hurt. You’ve worked diligently to tend the gift that was lovingly handed down to you by your forebears. Following Jesus in the best way you knew how, you’ve come to that point in the journey when you’re thinking about the church and what you leave for those who come behind. But those generations to which you’re looking to hand the baton, often appear uninterested in taking it. I suspect it must feel to you like a gift spurned. You care so much about the church you’re leaving behind. And it seems clear that younger generations don’t care about it the way you do. They’re walking away. I can’t imagine the hurt. But my friends, I’d like you to consider a couple of things -- things that are almost impossible to see when you feel betrayed. These things are difficult. So, you should hear them from somebody who cares. First, taking out your anger on those emerging generations isn’t helping you to “win them back.” In fact, what I feel certain is your quick response to feeling hurt (as if your gifts aren’t good enough -- and that’s about as painful as it gets), only serves to reaffirm to younger generations that they’ve made the right decision about leaving. To them your response to the pain sounds angry and bitter. (I know, I know, I know that’s not how you mean it. But that’s what it sounds like if you’re on the other side of the complaint.) It sounds to them either like you’re fretting about what their leaving means for your hopes and dreams (without ever finding out about theirs), or that you’re blaming them for not being who you think they should be (again, without bothering to consult them). Second, and this might be difficult to conceive, but maybe some of those who don’t want to “do church” the way you’ve always done it will find some new and exciting expression of faithfulness that will rock the world. Of course, a lot of the ones who walk away don’t care much about finding “some new and exciting expression of faithfulness.” I’m not naïve. But there are some young people out there who love Jesus just as much as you or me, but who remain convinced that the way we’ve done church in the past is an obstacle to following Jesus. Instead of acting as a midwife calling forth new and vital spiritual expressions, in their eyes the church has become an uptight bureaucrat from the DMV, double-checking everyone’s information, determined to screw with the lives of the unsuspecting. Young people are going to do some amazing things in the name of God’s justice and expansive vision of shalom. Moving forward, we need to ask ourselves if those things will be done with the support and encouragement of the church … or in spite of it. I’ve grown accustomed to the popular ecclesiastical trope, which argues that liberal denominations are dying because they’re liberal. As somebody who writes about this stuff, I can spot the whole liberals-are-killing-the-church thing from a mile away -- because of their love of gay people, and black people, and poor people and immigrants, etc. I get it. If mainline Protestant denominations would just shut up about all that liberal stuff -- the soft stuff that gives liberals a reputation for bleeding hearts (like caring about the poor and the oppressed), and start focusing on the real moral problems confronting American life -- like gay marriage, or the loss of traditional family values, or “the war on Christmas” -- then they wouldn’t have to worry about bleeding members at such distressing rates. But I recently came across another line of argument, which basically argued that liberal churches lose people because liberals aren’t arbitrary jerks. The article from last year sets down the hypothesis that what inoculates conservative churches against the viral depredations of decline are strict rules that don’t necessarily make sense, but that are highly exclusionary and keep members securely in the fold. It seems that arbitrary edicts are a magic bullet that help prevent people from reflexively checking for the exits. Things like keeping women in their place and LGBTQ people on the run (Southern Baptists, conservative Catholics and other strains of fundamentalism), fidelity to Republican politics and tithing (mainstream Evangelicals), wearing funny underwear and steering clear of Coca-Cola (Mormons), belief in glossolalia and public healing-on-demand (Assemblies of God and other Pentecostals), it seems, are the tickets to putting the brakes on decline. Emphasize some tangential point of doctrine as the mandatory cost of admittance, and you are well on your way to creating a more stable membership environment, one that will defy the downward trend experienced by the less committed among mainline Protestants. But, I mean, come on, we follow a guy publicly executed on a garbage dump. How concerned with “success-as-survival” can we be? If congregational or denominational survival requires something other than faithfulness, then the message of Jesus’ life (and death) is that it’s not worth it. Jesus doesn't call us to succeed; he calls us to die. Consequently, we who would follow him can never have as our primary consideration naming that which will save us from death. Are we too liberal? Do we have enough arbitrary rules to halt the decline and sustain a stable membership? These are questions that should be qualified by being asked in light of the most important question: Are we following Jesus faithfully? Until the latter is answered satisfactorily, the former are merely distractions. A few years ago, I interviewed with a search committee for an associate pastor position. As I was answering their questions, a well dressed and refined elderly woman asked me a sharp, direct question. "What do you have to offer this church?" Feeling caught off guard, I scrambled to think of something to say. After hesitation on my part, she said, "I bet you could offer us a new set of eyes." Around the table I heard snickers, because some thought she was making a joke about the graying of the congregation. To the contrary, she was making a serious observation. She went on, "As a young adult, I bet you could help us to see our ministry from a new perspective. If you are given the opportunity to be our associate pastor, I hope you will use your unique experiences in life to help us better understand how to minister to the world around us." Sensing her wisdom and authority, I nodded my head and agreed. Her words still stick with me today, as I think about what it means to be the Church. God's people are at their best when they are eager to see the world through the eyes of others. Jesus spent a great deal of his time inviting those who gathered around him to see the world through the eyes of others, especially the poor, downtrodden and marginalized. Our faith grows and deepens as we step into the shoes of those who are different from us. Do you think it would make a difference if your congregation made the effort to see the world through many different eyes? I am not asking you to look at the stereotypes that our culture often uses to describe groups of people, but to make an effort to stand in the shoes of individuals who are often complex and multifaceted. Ask yourself what life is like for a young adult, a gay or lesbian person, an unemployed person, a homebound person, a person outside the Church, or a person of another ethnicity. I am willing to bet that if a congregation empathizes with those who are different than their average member, it would reshape their ministries for the better. A large part of our struggle as mainline Protestant congregations is our unwillingness to see the world through the eyes of others. Recently, I met with a group of faithful church people who happened to be significantly older than me. As a young adult in the Church, I have grown accustomed to my interests and concerns being underrepresented in church meetings. After I finished introducing myself to the group, a middle-aged person said to me in a dismissive tone, "How old are you? You don't look old enough to be a pastor." This individual's tone suggested that not only did I not have the experience to be part of the group, but I did not have anything of value to offer. As I tried to remain calm, I thought to myself, "Yes, you're right. The last thing the Church needs is the voice of a young adult at the table. It is doing such a wonderful job of attracting people my age on its own!" I wonder if this condescending remark could have been avoided if this person had dared to see the Church through the eyes of a young adult. This individual's limited perspective is part of a larger mindset that is driving young adults away from our congregations. The reality is that young adults have much to offer. In case you are wondering what a young adult sees when they look at your church, let me offer you some perspective. Often, we see churches that are either trying too hard to attract younger generations by turning the church into entertainment centers with large screens, high-energy bands and perfectly constructed stages, or congregations that are not trying at all and seem content to pretend we are still living in 1955. As a young adult, I don't want to participate in either one of these congregations. Instead, I am seeking a congregation that is willing to engage the 21st century, foster deep relationships, minister beyond its four walls, and dare to share God's love with everybody. I believe that if the Church wants to thrive in the 21st century, especially amongst Generation X and Millennials, it must boldly look through the eyes of others. It is in the intersection between those currently in the pews, and the needs, interests and dreams of those outside the church walls that we will encounter the living God and discover the future vision many of our congregations desperately need. Then, the Church will have no other choice but to let this holy energy spill over our walls and into the world. Billy Doidge Kilgore is an ordained minister in the Christian Church (Disciples of Christ) and affiliated with the United Church of Christ through an ordained partnership. Billy blogs at ourdeepestselves.com. October 22, 2014 in Community, Mainline Decline, what next? I grew up in the Roman Catholic tradition, which for my family was more of an ethnic identifier than a faith community. The church was there for special rituals in life, but it wasn’t until I lived in Ireland that I discovered a more intense relationship and thus I began my search for church in my adult years. I will never forget the great performances done by my peers in Connecticut through the Walter Shock School of Dance. I had only participated in ballroom dancing, as everyone in my town of affluence did, but I simply enjoyed the larger theatric performances. I can recall the time break dancers came to our school, and when we went to see a Soviet dance company share mostly traditional dances. This started my love of dance that brought me to love ballet. So both of these important parts of my life now were not part of my formative years. Most people that love dance as an adult danced as a child, and constantly in the church I hear about youth church camp experiences and/or how one was raised in the church. Neither of these is true for me, but that doesn’t make me any less of a fan, and the best fans are actually critics. I think there is a unique perspective from those who discover church as an adult rather than those who have grown up with it. There is an outside appreciation that may be overlooked. The same may be said of fans of dance who were not dancers in their youth—there is something unique that draws them in. I read this over and over, and I could not help but change the word artists with pastors and choreography with worship. And I must say this applies equally to ballet as it does to the church. Is this a pure coincidence? Is this a problem of post-modernity? Is this a problem of consumerism? Honestly I think there is more hope for ballet, for it is an artistic form that can explore the divine and humanism equally with no dogma, while the church has found itself stuck in a battle of dogma rather than following the one that preached against organized religion: that Rabbi Jesus. But maybe we can take the forms and discipline of church, as with ballet, to new and very different ways we cannot even imagine. [i]Homans, Jennifer (2010-11-02). Apollo's Angels: A History of Ballet (Kindle Locations 10507-10512). Random House Publishing Group. Kindle Edition.